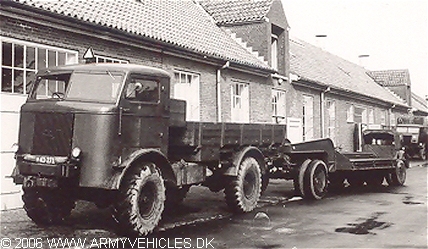 Danish Army Specific: The FWD SU-COE was delivered as a part of the American aid program (MDAP) between 1951 - 1955. The shown example which where used by the engineers is drawing a trailer of unknown origin. Used for haulage of dozers etc. Historical: Militarised cab-over-engine (COE). The chassis was produced by FWD at their factory in Clintonville, Wisconsin, and then shipped of to Wilson Motor Bodies in Kitchener, Canada to be bodied. Supplied mainly to Britain within the Lend-Lease programme during WW II for use as a medium artillery tractor. All-wheel-drive was permanent. There was a lock-able third differential in the transfer case, so that maximum traction was obtained at all times without wind-up in the drive line. Bodywork on the artillery tractor was similar to the AEC Matador artillery prime mover. Also produced as a tractor-trailer version. The SU range was also commercial available in conventional form. Length: 6.37 m (251 inches). Width: 2.43 m (96 inches). Height: 2.87 m (113 inches). Weight: 11.970 kg (26.600 lb.). Engine: 6-cylinder Waukesha SRKR, 8.473 cm3 (517 cubic inches) displacement, liquid cooled. Horsepower: 126 at 2.250 rpm. Transfer case: Single-speed with lock-able center-differential. Fuel capacity: 382 liter (84 gallons). Range: 370 km (230 miles). Additional: Some equipped with a 10.000 kg (22.000 lb.) winch mounted between cab and bed.